As you may have guessed, my fights with Captain Couch haven’t been going so well lately. He has, in fact, gotten so full of himself and his winning ways, that he’s passed on his torch of torment to a new adversary, Lieutenant L.L. Seat. … In other words, I have a new sofa. The battles are frequent. It’s a whole new weightclass, here. I’m just no match. Please forgive my absence—it can take a while to get over these injuries. I’ve talked about my comics backlog a few times, and I’ve always hesitated to show you just how truly grotesque the situation has become, but I can hold back no longer. It’s time to unveil the horror. I tried to break them up into three piles to subdue the overwhelming magnitude a little, so in actuality, this doesn’t do it justice. We’re talking several years of stuff, here. Whole runs of things I’ve picked up and never gotten around to reading—things as far back as Daytripper, half a run of House of Mystery, and the final issues of Secret Six I never finished. I KNOW, okay?! I know. I know. By the way, this isn’t counting all the trades I have piled up. I’d estimate probably another two dozen unread collected editions of things. But I make this post for a reason! There is method to this madness! I have every intention to catch up, starting this weekend. And I’m going to be taking notes … oh, copious notes. Notes I will share on all the crazy comics crap I’ve been missing. Perhaps by announcing it to you before I actually do it, I’ll scare and pressure myself into action. Get ‘er done, as they say. Let’s hope there’s far more good than there is crap in the pile. Cross your fingers for me. And keep reading. Oh—one more thing. Look for these upcoming new posts in a somewhat unexpected place. This entry was posted on 07/27/2012 by ravenhaired. It was filed under Comic books, Reviews, Uncategorized, What I'm Reading / Wednesday New Comics and was tagged with A new challenger appears, I can't write, The horror. 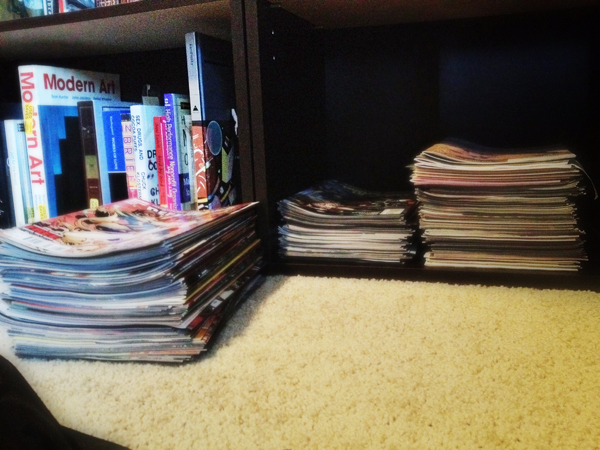 Ok, that is a LOT of comics … I’m insanely jealous. I would love to have that much new stuff to read. But you have something of an epic challenge ahead of you. It should be a lot of fun to read at least. You should stack up the GNs too though … Show us the true extent of the battle at hand. You know, I’d considered that, but I’m not sure you’re ready for it…. I feel you I am so far behind in my issues that I need a week of just reading to did out. Spring started so early, and with a 4yr old that means active days so comics just haven’t even been looked at since like March. I kid you not. Ah. I was wondering why you haven’t posted any comic reviews in a while! I hear you, though. And I’d much rather be outside enjoying the summer while it lasts. Hear unto thee the words of Lord Vertigo, aka Sunday Guy, aka your friend Mark. I say to thee, skippeth thou the rest of House of Mystery and reduce the stack! Honestly, and I hate to be a critic, but I have and have read every Vertigo title, and HOM was not so good. Daytripper, on the other hand? Do yourself a favor and read that right away. Great stuff.